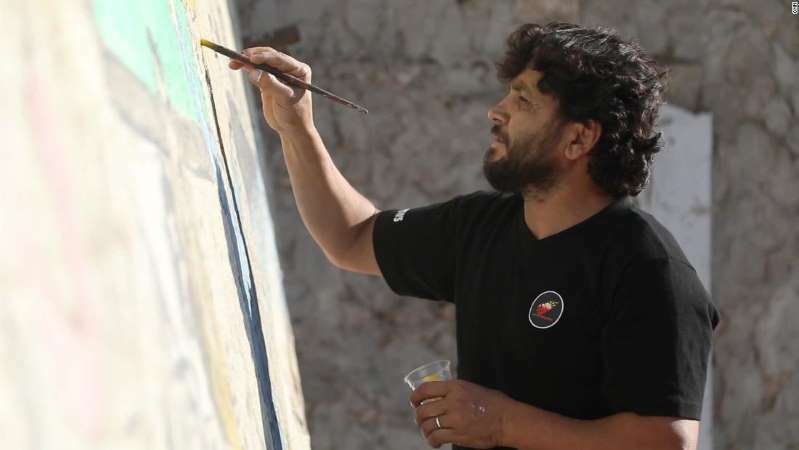 Artist Aziz Al-Asamr holds a plastic cup full of bright yellow paint and puts the finishing touches on his mural. His canvas: the collapsed concrete roof of a bombed-out house in the Syrian town of Binnish, in opposition-held Idlib province. He has painted US President Donald Trump, complete with a shock of yellow hair pointing skyward. The President wields a missile aimed at a field of green with crude depictions of a machine-gun, an artillery piece and a tank next to a "chemical hazard" icon. "I drew him [President Trump] giving Bashar al-Assad and the regime a green light to hit us with any weapons except chemical ones," says Aziz, surveying his work. For weeks Syrian forces have been massing around the edges of Idlib province, preparing for an offensive to retake the last major part of the country still under the control of the armed opposition. Earlier this week the White House issued a statement warning that if Syria uses chemical weapons in Idlib, the United States "will respond swiftly and appropriately." Syrians, still remembering President Barack Obama's famous "red line" speech in 2013, are skeptical. "Assad did hit with chemical weapons," Aziz says. If the Americans "wanted to remove him or finish him, they would have done it long ago." Video and interviews obtained by CNN from Idlib show people bracing for the long-expected government offensive, yet well aware that in this, what could be the final battle, they will probably be on their own. Sawsan Al-Saed runs a pharmacy in the provincial capital, also called Idlib. "I am convinced that there will not be any military operation," she says. Sawsan expects that Russia, Syria's main backer, will cut some sort of diplomatic deal with Turkey, which has been the most consistent supporter of the rebel factions in the north. If, however, diplomacy fails, she says she will leave. "Once we lose hope that we can't stay here, then we will have to escape, to Turkey or to Europe," she says. "Most people will take to the sea to reach Europe." Almost 5 million Syrians have left the country since the start of the uprising in March 2011. Nearly half Idlib province's population of over 3 million fled or was bussed by the Syrian government under safe-passage agreements to other parts of the country restored to Damascus' control. Among them are tens of thousands of jihadist fighters, including many members of what is known as Hay'at Tahrir Al-Sham, which in an effort to gain international backing has renounced its former affiliation with al Qaeda. For now, even if Sawsan or others wanted to leave Idlib, they can't. Turkey, which already hosts around 3 million Syrian refugees, has sealed the border. Refugees could flee to government-controlled areas, but there they face the possibility of fatal retribution. The people of Idlib are stuck between a rock and a hard place. So, many, like Yousif Al-Ahmad, who runs a well-stocked grocery store, plan on staying put. "Some people are worried and afraid," he says. "Some are thinking of fleeing. As for me, I'm not going anywhere." As for Trump's warning to Damascus, Yusif shrugs. "Now he's talking and talking and talking, but I don't think he can stop it," he says, referring to the pending government offensive. Ghaith Al-Sayid, a 21-year old greengrocer, is quick to admit he is worried. He's worried about Russian airstrikes and worried that civilians will, as they usually do, pay the highest price. "If they're going to strike us," he says, "we should get our women and children out." The atmosphere in Idlib city appears calm. Men sit in cafes, chatting, smoking and drinking tea and coffee. Boys play foosball on the sidewalk, laughing and joking without, it seems, a care in the world. Perhaps this façade of calm exists because there's hope the leaders of Russia, Turkey and Iran — all key players in Syria — will come to a compromise and avert one last round of bloodshed when they meet this Friday in Tabriz, Iran. Damascus is eager to crush the last pocket of armed resistance, and Russia, in a statement issued by Foreign Ministry spokeswoman Maria Zakharova, says it "will continue the fight against terrorists until their ultimate and total elimination." A diplomatic breakthrough might postpone Idlib's day of reckoning. A reckoning, however, is inevitable.